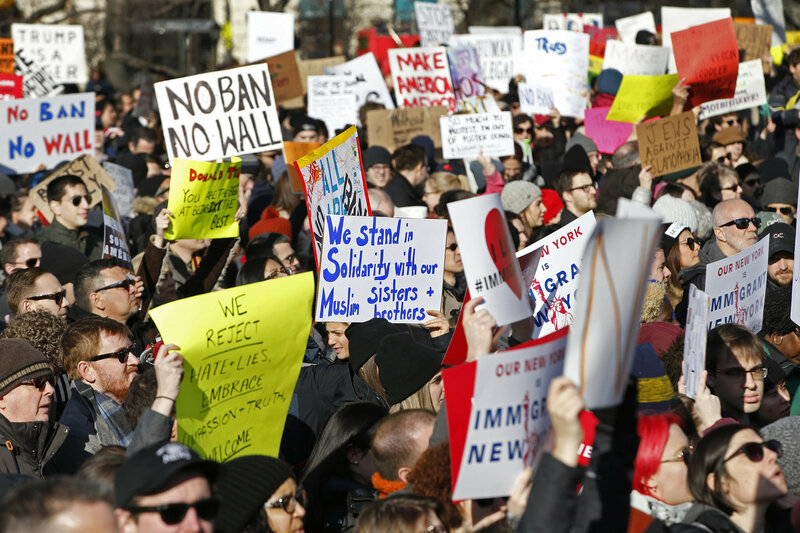 From the perspective of Muslims worldwide, it is heartening to witness the overwhelming anger and frustration from the international community as well as ordinary American citizens, against Mr Trump’s Muslim ban on travel to the USA. Trump’s Executive Order to ban Muslims travelling to the US, is short sighted, ill-thought out and potentially detrimental to US interests and National Security. It reinforces the widely-held perception that the US hate Arabs and Muslims. It will offer a platform to religious extremists and ISIS to radicalise young people and recruit fanatics on a platform of hate to harm US interests and that of their Western allies. The Americans who took to the streets have demonstrated their support of democracy, the rule of law and respect for human rights. Also, their determination to oppose injustice and inequality in accordance with the US constitution that was written by its founders to help and support those who are desperate and in need from anywhere in the world regardless of race or religion. Five of the seven countries being targeted are Arab countries. Therefore, the President’s Executive Order has effectively used the Islamic faith to also deny the citizens of these countries their Arabic identity. Citizens of all faiths from these targeted countries do not travel to the US using religious ID, they do so using their national passports. Immigrants from these countries did not voluntarily choose to leave their homes in order to start a new life in the US or the west. They did so because their countries have been destroyed and their livelihood has been shattered by US military invasion and intervention for no other reason except being born an Arab or into the Islamic faith. The death and destruction of these targeted countries is a direct result of the US policy of intervention, regime change, sanctions and the fight against terrorism. A policy which is the legacy of the New World Order and the project of the new American Century that has cost the US trillions of dollars and has had devastating consequences not only for the US but also for the countries in question. The emphasis on Islam in the Executive Order would only serve the interests and the propaganda of the ultra-right in the US who are obsessed with demonising the Islamic faith by constantly associating the faith with terrorism. Prior to the US military intervention, these countries enjoyed mainly stable secular governments who had no quarrels with the US and posed no threats to US interests or national security. Therefore, the citizens of these countries should have expected and ought to have received compensation and an apology form the President Elect, Donald Trump, and not a travel ban, humiliation and detention at US airports. Perhaps President Elect, Trump ought to have been honest with the American public by stating how many million Muslim citizens of these countries have been killed, ethnically cleansed or became refugees who have lost all livelihood as a result of US military intervention. The Cato Institute, a US Conservative think-tank recently published a report on the number of foreign terrorists from the countries being targeted by the Executive Order. The report tallies to zero, the number of Americans killed by citizens of the seven countries banned. The report clearly shows that there are no security concerns form these countries. Therefore, the motive of the Executive Order is purely one of race. One million Iraqi lives were sacrificed and billions of dollars were wasted during the Iraqi-Iranian war in the 1980’s to contain the aims and ambitions of the Islamic revolution of Ayatollah Khomeini. Sacrificed Iraqi lives saved the territorial integrity of Iraq and the Gulf region, as well as protecting the interests of the US and west in the region. The US interest was specifically targeted by the revolution of Ayatollah Khomeini. The US reward for the Iraqi lives was to invade and destroy Iraq as a country, destroy Iraq’s secular constitution and replace it with a sectarian one designed specifically to destroy Iraq as a nation, dismantle the Iraqi state, and hand Iraq over on a gold platter to Iran, the commercial ally of the US in the region. Iraq currently has a comprehensive defence treaty, the SOFA Treaty, with the US who in turn, enjoy the benefits of a range of comprehensive commercial and military deals with Iraq. There are currently thousands of US military personnel as well as business people who live and work in Iraq, while Iraqi citizens are banned from travelling to the US. Therefore, placing a travel ban on Iraqis visiting the US sits at odds with the spirit and terms and conditions of these treaties. In particular, as the current weak, sectarian, Iraqi regime is not fit for, or capable of addressing this action by a similar travel or trade ban on US citizens visiting Iraq. Iraqi officials, as well as Iraqi-born citizens who hold American passports or have a valid US Visa, are not allowed to travel to the US under this ban. The moral duty of Arabs and Muslims worldwide is to support and stand shoulder to shoulder with the American people who are protesting the illegal, unjust and racist Executive Order. Arab countries not targeted by the Executive Order,and those who answered the US call for the invasion and destruction of Iraq in 2003, have a moral duty to offer solidarity to those being targeted. Suspending visas for US citizens would offer a positive option. These countries should also use this opportunity of racial discrimination to redefine trade relationships with the US, a relationship which should now be based on the Exchange of Energy - for - Technology, not Energy – for – Security. A concept whereby the terms of the trade deals serve the interests of both parties on an equal commercial basis. Wasteful military deals should also be reconsidered to enhance the dignity, integrity and Arabic identity of these countries. History would testify that it is wrong for Arab countries to assume not being targeted by the US policy now would mean not being targeted at all in the future. The Shah of Iran, Ayatollah Khomeini, President Saddam Hussein and Colonel Gaddafi offer but few useful examples to note.